NEXT WINTER IN THE U.S. & CANADA . . . If we mention damsels and dragons to students on Guided Field Trips to Hilton Pond Center we sometimes have to clarify we're not describing a fantasy role-playing game, i.e., "Dungeons & Dragons." Instead we're talking about members of the Odonata--the insect order that includes Damselflies and Dragonflies. Although folks usually associate these gossamer-winged aquatic insects with slow, hot summer days, here in the Carolina Piedmont a few damsels and dragons hang on at least until the cool of mid-September (or even late October), so this week we went wading in Hilton Pond with our camera and telephoto lens to take a last look. 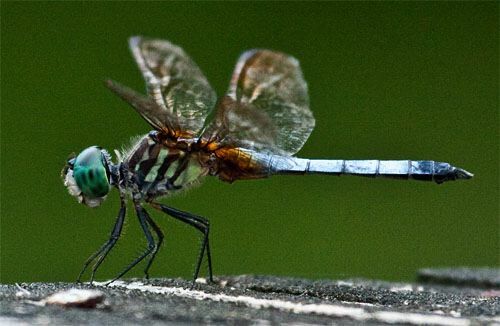 For years we've been trying to get ultrasharp technical photos of dragonflies and damselflies. However, for some reason--perhaps the "softness" of our long lens or the way we process digital files--our images always seem to turn out looking more like stylized paintings than photos. In any case, we've decided we kind of like them that way and include herein a selection of our pictures of Hilton Pond's "autumn odonates." The word "odonata" comes from a Greek word meaning "tooth," referring to the strongly serrated mandibles borne by dragonflies and damselflies. These mouthparts are put to good use when chowing down on smaller insects. (Although odonates don't "bite" people, we can testify after removing three-inch-long Common Green Darners snared in mist nets that a big dragonfly can give one's finger a surprisingly sharp pinch.) Some entomologists call all odonates "dragonflies," but depending on the age (or bias) of your source you will find disagreement on odonate nomenclature and taxonomy. 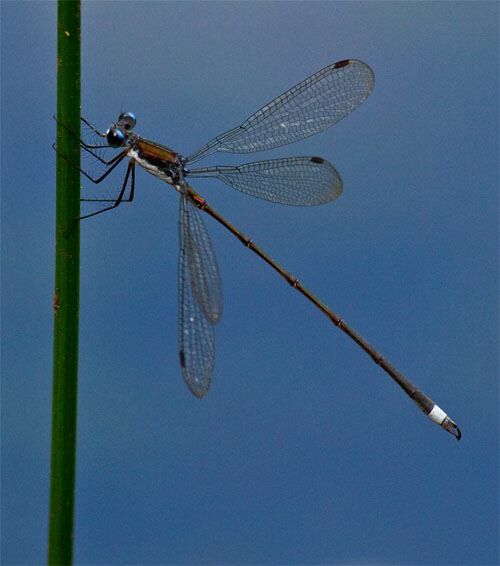 Historically, damsels and dragons were thought different enough within the Odonata to have their own suborders: Zygoptera ("joined wings") for damselflies, and Anisoptera ("unequal wings") for dragonflies. A third suborder--Anisozygoptera--included two "living fossil" species from Asia. These days, based on interpretation of DNA studies and other criteria, some taxonomists arrange things a little differently; we--and many professional odonatologists--stick with the traditional naming system. While we waded this week along the edge of Hilton Pond, we first trained our camera lens on emergent stems of aquatic rushes that began colonizing the impoundment's muddy banks about six years ago during the last prolonged drought. These plants now provide numerous resting spots for various local species of damsels and dragons. The first photographic subject we encountered turned out to be a slow-flying damselfly species new to Hilton Pond: Swamp Spreadwing, Lestes vigilax. This is a rather large damsel, with typically thin abdomen and thorax and an overall length up to 2.25". In males (two photos just above) the bulbous eyes are blue, each side of the thorax has a chestnut longitudinal stripe and its ventral surface is very pale, and the abdomen has a bright white penultimate segment; at the tip is a modified structure known as a "clasper" (detail, above right). The clasper serves a very important function in damsels and dragons, for it is this device with which a male grabs the female during mating. 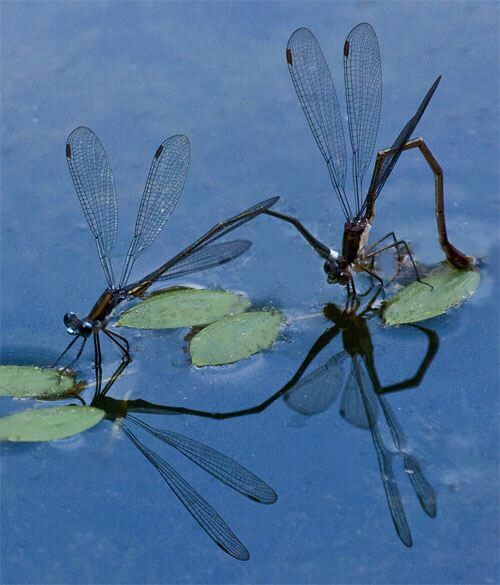 In our photo just above of two mating Swamp Spreadwings, the male (at left) has clasped the female by the neck. (Note the female also has a white ventral thoracic surface but that her abdomen lacks the white segment; her distal segments are fatter and contain her egg-laying apparatus.) When a female spreadwing is ready for actual copulation, she lowers the tip of her abdomen and curves it upward until it contacts the male's genitalia at the anterior end of his thorax--known as the "wheel posture." After sperm are released the duo straightens back out. Following fertilization the male often continues to clasp a female until her eggs have been laid, assuring no other male has opportunity to sneak a copulation; thus, we can't determine whether the photo above depicts "before" or "after." Likely the most colorful of all our Hilton Pond odonates is the male Eastern Amberwing, Perithemis tenera (above), whose brilliant orange wing veins and abdomen make it stand out even against dark waters. It's a good thing this dragonfly is so colorful because at a mere 1" long it might otherwise be easily overlooked--which may be why we haven't spotted any females that have brown bodies and wings that are colorless save for a few brown splotches. The diminutive male defends a territory about four yards in diameter and lures the female to the center for courtship and egg-laying. Some authorities say amberwings avoid predators by mimicking wasps that bob their abdomens while moving wings up and down. Several species of blue dragonflies occur at Hilton Pond Center, and not all of them are easy to identify. It helps when they perch long enough for a photo, as happened with the two-inch-long male Slaty Skimmer above. 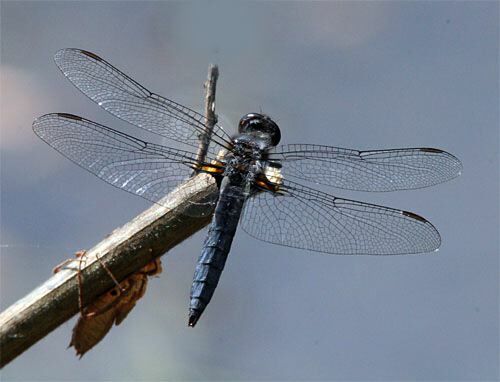 This species, Libellula incesta, can now be added to the Center's list of known odonates. Male Slaty Skimmers, so blue they're almost black, have sharply tapered abdomens and very dark eyes. Females (not pictured) have yellow-brown bodies and brown eyes. 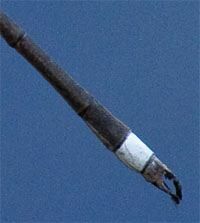 The amount of black coloration in the wing tips varies greatly and makes species identification all the more difficult. Thankfully, Giff Beaton's Dragonflies & Damselflies of Georgia and the Southeast (Univ. Georgia Press, 2007) includes large, clear illustrations that have been especially useful in our on-going effort to expand the comprehensive checklist of locally occurring insects. Eastern Pondhawks, Erythemis simplicicollis, are fearsome predators, capable of taking prey almost as large as they are--including other species of odonates. Dark chalky-blue males (not pictured) patrol large areas of Hilton Pond, establishing territories constantly under attack from other pondhawks. The female (above) has a green face and thorax and alternating bands of green and black on the abdomen. Note the sharp and slightly decurved spines on this Eastern Pondhawk's legs. Such projections occur in some form or another in all dragons and damsels and help grab and hold prey as the odonate gives chase. 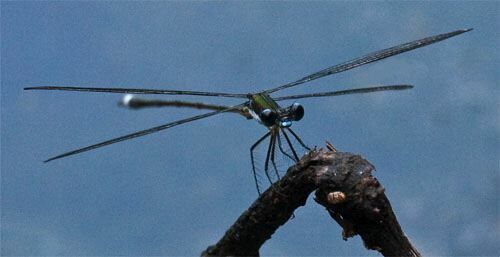 Among smaller damselflies and dragonflies, softer and hairier projections snare little flying insects such as mosquitoes--a favorite food of many odonates. 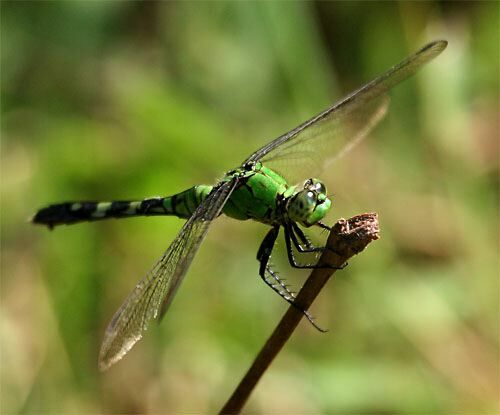 Although there are a couple of published reports of big dragonflies capturing and flying off with hummingbirds, we find these reports questionable. More likely the observer saw the dragon take a smaller and much-lighter Hummingbird Moth. 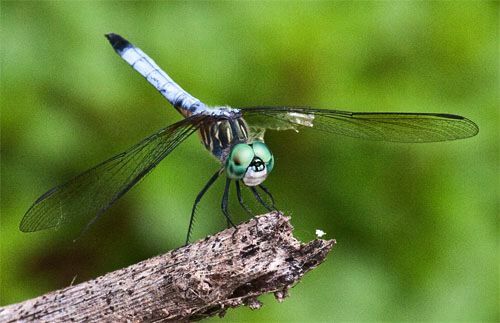 They've probably been flying around Hilton Pond as long as we've lived on the property, but not until this week were we able to conclusively identify another of our medium-sized bluish dragonflies--the 1.5-inch Blue Dasher, Pachydiplax longipennis. The male (above and below) has a light blue abdomen tipped in black; its thorax is diagonally striped in brown and green, the face is white, and the eyes are emerald-colored. 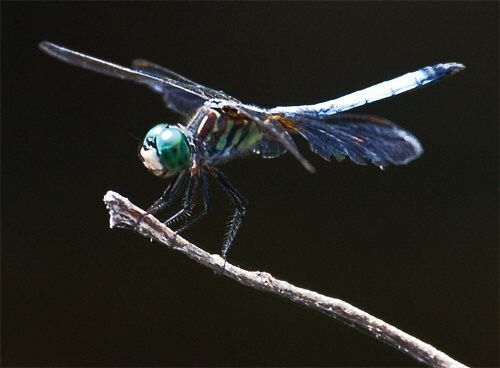 In addition to the pigmented dark cell on the front edge of each wing (above), the Blue Dasher sports a translucent brown "saddle-spot" at each wing's base. 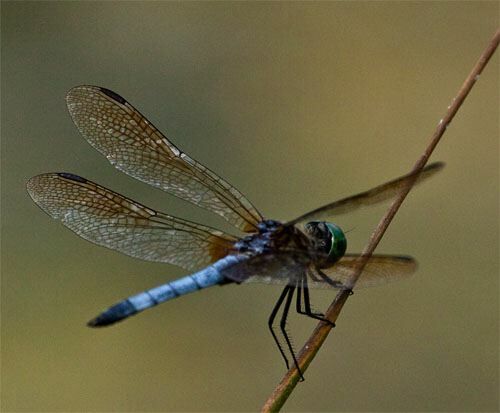 As in many odonates, the Blue Dasher female (not pictured) looks much different from the male; in this species her yellow-brown abdomen is brown and less pointed, and her eyes are red-brown instead of green. Two more photos of the male Blue Dasher reveal some interesting things. 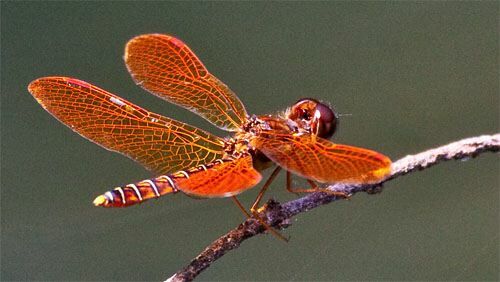 In the image above, it's apparent dragonflies are adapted for flight; in fact, their streamlined but front-heavy shape is reminiscent of modern-day jet fighter aircraft. A second view of a Blue Dasher (above) shows just how hard wings have to work in dragonflies as they feed, court, and defend. In this particular male, the left hindwing is nearly gone--possibly the result of contact during territorial battles with other males. In fact, if you scroll back up and examine all our odonate photos above, you'll see several of them depict wings with varying degrees of raggedness. When one considers how many times dragonflies have to flap these seemingly delicate structures, it's amazing the membranous wings last as long as they do. By now--the middle of September--damsel and dragon wings are indeed wearing out and it won't be long until a cold snap brings the lives of these predatory insects to a close. All is not lost, however, for those frenzied months of courting and copulating produced hundreds of eggs that will hatch sooner or later, giving rise to voracious aquatic nymphs that patrol the winter pond bottom in search of tasty invertebrates. Next year each successful nymph will slowly ascend a twig above the water on Hilton Pond, leave behind its old exoskeleton (above, with a summertime Blue Corporal), and emerge as an adult--a brand-new damsel or dragon ready to take its place as one of our picturesque "autumn odonates." --This week we also had a returning after-4th-year female RTHU banded at the Center in Jun 2006 and not seen since Jul 2007. This bird was only the third returning RTHU for which we had a first annual encounter as late as September. --On 13 Sep we captured a hatch-year male Ruby-throated Hummingbird that became the 4,000th of his species banded at Hilton Pond. --While walking the property this week we found a banded Eastern Tufted Titmouse dead alongside a trail near the pond. Upon returning to our office we checked the number and were surpised to find we had banded her as a recent fledgling back in May 2003, making her a rather old 7th year bird. We found no external marks or other problems, so it may be she just wore out--understandable since a titmouse pair typically raises 4-8 chicks per year. --Mosquitoes that had been essentially absent from Hilton Pond Center during 2009 exploded onto the scene in late August and now zillions of representatives of a very tiny variety attack us whenever we go outside. They're far more numerous than the much larger stripe-legged Tiger Mosquitoes that showed up here 15 about years ago. We're not sure what happened to cause this week's sudden incursion of miniature blood suckers, especially since there's been almost no rain the past month. All those dragonflies--AKA known as "mosquito hawks"--discussed above need to work a little harder to reduce the local 'skeeter population.